Did that title catch your attention? No, don’t worry, I am not saying you shouldn’t be giving a break. But, the function of the break really should shape what it looks like and how it’s used. Lots of teachers I meet assume, or were taught, that students with autism and students with behavioral issues need to have breaks built into their day. And yet they find their break times to be some of the most difficult times of the day. Often that’s because we aren’t creating the break that our students need or using it the way they need. I’ve talked before about options for how a break might look. But that was specific to one type of function when you are teaching a student to request a break to address escape-related problem behavior. 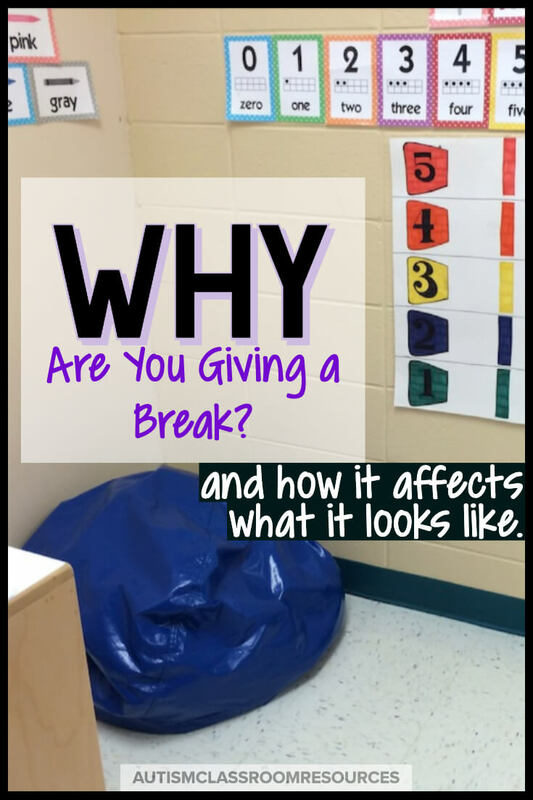 So let’s look at the reasons we might have a break area in the room and have breaks scheduled into our students’ schedule. When I talk about breaks in the classroom, I’m typically referring to using them when a functional behavior assessment indicates the behavior functions to escape from a situation. In those cases, you have to create break experience that fits what your FBA has told you beyond just that he wants to escape from a situation. And then you are teaching the replacement behavior. Does he want to escape from other people? Does she want to escape just work demands? Just math? Social situations? I’ve talked about all of these issues in this post, so I won’t repeat them here. Sometimes we schedule breaks into the day because the student needs a work-break routine to stay engaged with instruction. These breaks can be something they take while staying in the instructional area, or they could be scheduled events of their day. Essentially, we are breaking up our instruction to keep the student engaged. In this situation, you might want to think about the break being an easy task the student can do in the instructional area. That way you don’t have issues with transitioning back to the work area. You could also use a fun activity the student can do in the same area. If the student needs to have a break from the whole instructional setting, though, you could create a break area that the student goes to that has activities she likes to interact with. Just keep in mind that you will need to integrate in enough time for transitioning back and forth. Sometimes we give breaks to try to help students regulate their sensory system. Think about it, we all take breaks at times when we get overwhelmed. If you’ve ever tapped out of a crisis situation (with someone replacing you), you know this feeling. In those cases, you might create a sensory corner as a break area where the student can engage in calming activities. The important component here, though, is to have a good understanding of the sensory needs of the student. Does he or she really need a sensory break, or is it something we think we need to do because the student has autism or seems to get overstimulated? And if you do think he needs a break, you’ll need to know what is calming for the student. For some, it might be something active, while for others it might be a beanbag with low lights. And given that you rarely have 1 student in your classroom, you may have to create multiple areas with different sensory types of activities. And sometimes we create break times because we need a break to allow us to work with another student. At that point, I would I say it doesn’t necessarily have to be a break you give the student. Instead, think about something that will clearly engage the student. It could be a leisure skill he is likes to do. It could be time in the independent work area. Or it could be work tasks at the table. All of these work as a break for some of our students and allow you to work with other students and give them attention. So often we use the term “break” and we mean lots of different things. We also are told by other teachers that all students with autism need “breaks” or “sensory breaks.” If you’ve been reading this blog for a while, you know that I would say, be careful of any statement that implies “all students with autism need…” It’s such a diverse population that they all need something different. So, think about the function of your break time. What is it doing for your student? That’s going to guide what the break looks like, where it might be in the classroom, and what happens during that time. This post came from a discussion in our free Facebook group. I’d love you to bop over there and join and share your thoughts. And if you are looking for more schedule and behavioral ideas, consider the Special educator Academy that has training and support in both of those areas. ​Come check us out. We have a whole course, workshops and even a podcast that deal with just these kinds of issues. It’s funny you bring up the function. I have a student who’s previous BIP outlines her asking for a break when she gets overwhelmed at the table work. In the afternoons, she is likely to request a break because she is typically tired during the afternoon (she doesn’t sleep well at home.) In the mornings when she becomes frustrated at work and begins to tantrum we always have to give a major gesture prompt and sometimes a verbal prompt for her to ask for a break. She’ll say “no break!” bc she really does want to keep on working. She likes working. She just has low self-regulation skills when it comes to being frustrated. Frustrations usually come from something that is more difficult for her…or a different person being with her, say the OT. So in her case, she might need to ask for something easier or to work with a different person…rather than a break.